Why should you track Goals with Web Analytics? Understanding your website users is an important part of managing any website. You don’t have to be selling online either to benefit from web analytics as I will show in the following article. Understanding goals and funnels and why they are important should be a top priority for anyone who has invested money into a website. Even if its just a hobby site. First of all if you are currently not using web analytics on your website I strongly suggest you do, as it will help you understand more about your website visitors and what they are doing and perhaps not doing on your website. What if your not selling online? That’s fine, because not all conversions are strictly an online transaction. You can get Google Analytics for Free here. In their simplest form a goal is a desirable outcome on your website. It can be a simple objective such as the view of a key page, or it can be a more complex one such as making it to your “thank you for your purchase page” after completing a series of other tasks in your checkout process (a funnel, which we will get to later). Why should I use Goals? Goals can tell you a lot about where your visitors have been and what they were doing before they reached the desired outcome on your website. You can see what pages they were looking at before or what sequence of pages lead to a conversion / goal. You could also determine what keyword’s they typed into a search engine such as Google, before reaching your goal page. There are many reasons, but possibly the most important reason to use goals is to monitor and improve. You can’t know if you are improving your website with design changes, or with online or offline marketing activities if you haven’t set any goals. Looking at the graph above, you will note a couple of things. First of all there is not dollar value associated with this goal. In the case of the website these stats are from, this is fine as its a hobby site for enthusiasts of a certain make and model car. It is not a profit driven website. I unfortunately do not know of a dynamic way to set a goal value in analytics. By dynamic, I mean setting a value automatically, if this was a shopping cart “thank you” page, you would want to insert the total sale value as your goal value. As far as I know you cannot do this with Analytics, it is a fixed value. You can however do this with Google Adwords conversion tracking code (another topic for another day). If you wish to set a goal value, I would suggest doing so using an average sale value or a conservative value. Don’t use the most expensive product on your site’s value if you care about accurate figures. Conversion Rates, Low, High, Bad, Good? The second thing you will notice in the graph above is your conversion rate. In this case its a low and sad value of 0.25%. Many in the industry may balk and say, that’s extremely low. They may be right, but before you judge conversion rates, remember certain industries will have higher conversion rates. The description and information on each product. The price of the item, have you compared it to your competitor sites? What influences conversions? What days are best for conversions? From the graph above you can also see a daily snapshot over the last 30 days of Goals. You can see one one day I had up to 4 goals reached. Did I do anything special on this day? Digging into the report further I could probably determine if they came from the same source. I might find that someone mentioned my website on another forum or discussion board on that particular day. As a result users of that particular site decided to join up to my website also. As I’m working with relatively low numbers its hard to show any patterns, but perhaps on another site with more traffic and more conversions we might see some important patterns emerge. As a final note on this graph, the goal I’m measuring is user registrations. So now I have an understanding of my goals, how do I learn more about them and find the interesting bits? I’m glad you asked, lets dig further. First lets look at a simple way to filter my website visitors. As you can see a majority of my visits are in Australia. Not surprising given that its an Australian based website. However I do have a large portion of visits perhaps 1/4 of which are from other regions around the globe. They are less likely to register on the site, but they are still free to do so. This could be one reason why conversion rates are low. Reversing goal path, allows us to see what page the user was on before they carried out the desired action (goal). Its a little more complex to understand, but stay with me here. Perhaps the most juicy bit of information is finding out what keywords convert best. That is keywords or terms users put into a search engine that resulted in them registering on my site. For the record my site does not use Google Adwords for traffic as it is a non-profit website and relies heavily on search traffic and third party referrals. If I was to run a Google Adwords campaign, these are the keywords I would most likely use in my campaign. Now I’ll learn who were the best referring websites for Goals or user registrations on my website. This is good because you will learn who your friends on the internet are. Looking at the graph you can see a couple of websites sent visitors who registered. One is a website I submitted my website to a long time ago, in order to build up links and page rank to the site. The added benefit is that it helped to increase my registered users. On some sites you may have a huge number of goals reached by a referrer, this could be an ideal opportunity to get in contact with the owner of that website and further improve your conversions, by either placing an advertising banner on that site, or perhaps asking to be featured in a more prominent position of that site, like the home page for example. How would I improve my Goal conversions? If I wanted to improve my goals, in my case it would be user registrations there are several things I could do. I want to stress again this is a hobby site and only part time attended to, so these changes may not happen for a while, if all all. 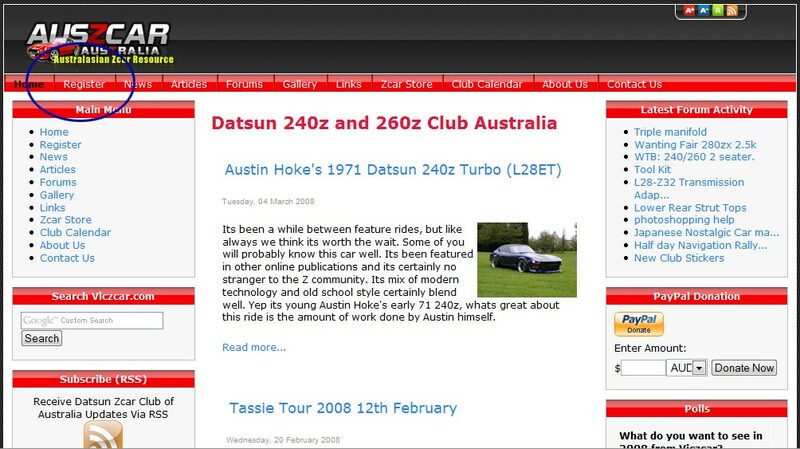 I have received several emails from users asking how to join my car club / website. 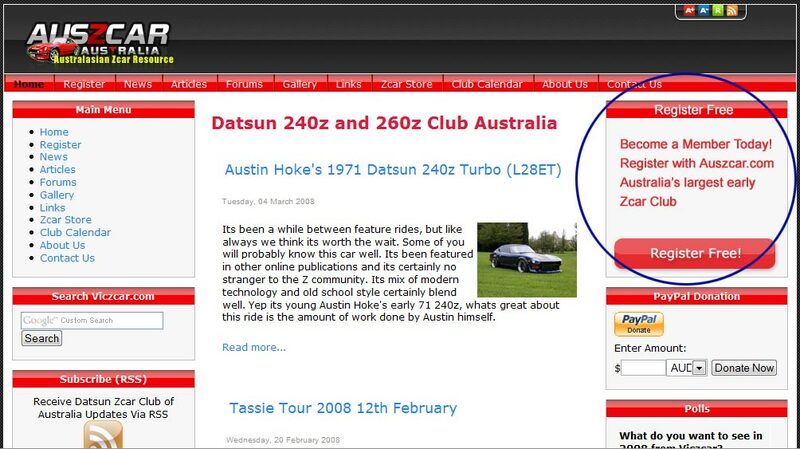 They often expect a membership fee or don’t know that they can register on the forum. To rectify this I could place a more prominent feature on the home page, or I could write something on the about us page to try and explain the registration process. Usability testing can help you unlock potential problems users are having on your website. A common problem with owning a website is that you become used to it and some of the quirks involved. You might know how to achieve certain outcomes on your site, but new users could be lost. User testing is important. Accessibility can also form part of usability. Your design can often have a big impact on desired action of your website. A good way to see what stands out on your page or goal page is to step back about 2 meters from the screen and look at your website. Look for the parts that stand out or are easy to read at a distance. Chances are this is what alot of first time users see (only!). Here is the current design of the site. You can see the register button is highlighted by a blue circle around it in the top left side. Here is a suggested change to the registration process. To perhaps improve conversion rates. You can see I mentioned the magic word FREE. I also put a nice large button on the page so you can clearly see it. It stands out more than before. In summary a goal or multiple goals can provide you with the information you need to help improve your website. You can see just from looking at the data I’ve acquired at the high level, I have already come up with a design change that could help improve conversion rates. I also know what are the best keywords that have resulted in user sign up’s and I can also see the best referring websites for conversion rates. Setting up goals are quite easy, once you have Analytics installed. If you haven’t defined goals on your website yet. Consider doing it sooner than later, you never know what you’ll discover. Interesting post, keep the good stuff coming, good content appreciated! It’s been a while since I’ve used this report but it looks like it’s since been updated and the >> is no longer in use. However the >> just indicates a user moving between paths. 2. You can see the visitor entered the website and landed on your /freetrial.php page. This is the main difference between the 2.